Published: May 25, 2011 at 02:01 p.m.
Congratulations to Hines Ward for winning the famed Silver Ball award Trophy on Dancing with the Stars. And he had to win this thing, too. Losing to Aaron Rodgers and the Green Bay Packers is acceptable. Losing to Kristie Alley in anything other than a hot dog-eating contest is not. But what's next for Hines Ward? The time to strike is right now while your popularity is at an all-time high. Cash in and follow in the footsteps of those other Dancing with the Stars champions who have gone on to be household names. You know, Drew Lachey, Shawn Johnson and Emmitt. Here are the best six ways for Hines to cash in on his new-found fame (outside of the NFL galaxy). Well, Ward should put his new dancing moves to use and what better way than to backup one of the most popular singers in the world? And while Ward did wear some strange costumes during his Dancing with the Stars title run, is he ready to wear a vest made of bacon? Harold Camping really can't be trusted to pick a new date for the rapture, seeing that he is currently 0-2. And since Ward just won a reality TV show contest, that makes him just as qualified to throw a dart at the wall to pinpoint the day of the rapture. Hines needs to be in a celebrity couple, and since Kim Kardashian is currently engaged (which seems about as stable as coaching the Redskins) he needs to find somebody to make the ultimate power couple. And good news, Shriver is available. Hook up with her, get your own reality TV show and with those political connections we could be looking at the next governor of Pennsylvania. A number of NFL players have made the leap from NFL star to professional wrestler. Most notably Bill Goldberg. And since the loss of the Macho Man and the possible WWE departure of CM Punk, professional wrestling needs somebody to put John Cena in his place. Besides, Ward could show Cena how to throw a real shoulder block. If the world of professional wrestling doesn't suit you, maybe professional boxing would be the ticket. A number of NFLers have taken to the ring during the offseason, including Tom Zbikowski and Ray Edwards. Fighting Pacquiao might be a bit ambitious, so here would be a nice fight to get his feet wet. If Ward could stay on bull longer than it took you to read this sentence, then he would have had a more successful bull riding career than Chad Ochocinco. Although, this would hardly be the first (or second) time that Ward was better at a sport than Ochocinco. And that's the rub, Ward could go back to just being a football player. 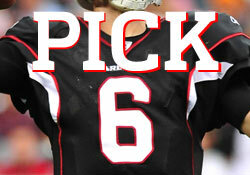 "Pick Six: Ultimate bachelor party entourage..."